Where is Bob? 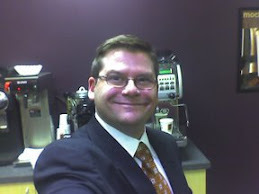 : Guest Blog from twitter handle @danmoyle - a2fer - Go Kalamazoo! Guest Blog from twitter handle @danmoyle - a2fer - Go Kalamazoo! I love pulling up to my local Biggby. I've been going there for years. Since it first opened in fact. It's one of two logos my daughter knew before she new letters. Biggby and Meijer - because the coffee shop is across from the store! When I pull up to the drive thru I know someone inside will greet me with an enthusiastic "Hi! I'm 'so-and-so.' What can I get ya?" And it's never "Is that all?" No... not at Biggby. it's always "What else can I get you?" I love the optimism! Now here's were it gets fun. The baristas know me because of my nearly-5 year old daughter. She always wants her own whipped cream (which she doesn't always get - but mostly does) and she always wants to roll down her window and talk to the Biggby barista. And they talk back. It's like old friends having ... well, coffee! And when she's not with me...well they always want me to tell her hi for them. So from my low cal Mocha Caramel to the cup of whip for the wee one -- to the terriffic optimism-- my Biggby drive thru keeps me coming back for more. It's fun to B Happy!! I love hearing stories like this! The BIGGBY baristas are the best! Their upbeat attitude along with the GREAT coffee keeps me coming back! This is what it is all about - the difference we can all make in each other's lives by being positive - happy, making friends, drinking great coffee and loving people. I know you do as much to inspire us on twitter and fbook as we do you in the drive thru! You can't fool kids. And if kids are into it, then the parents are sure to follow. So, to all of you out there, treat kids right! I love this Biggby. It's just down the street from my office, which makes it very convenient for a coffee run. 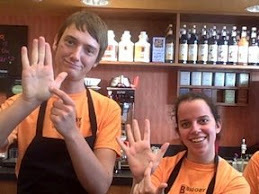 I must agree, the baristas at this Biggby are extremely friendly. Thanks for brightening my day.